Two days earlier, I wasn’t impressed with this place. Kedak, our driver, dropped us off, and we could tell he was eager to leave as soon as possible. Seminyak’s suffocating traffic had clogged the main arterial road and the symphony of car horns was making this small beach town feel urgent and stressful. My first impression of the beach wasn’t good either; for such a popular tourist hotspot, I truly couldn’t see the appeal of the flat ocean and sticky black sand. “Is this it?”, I thought to myself. 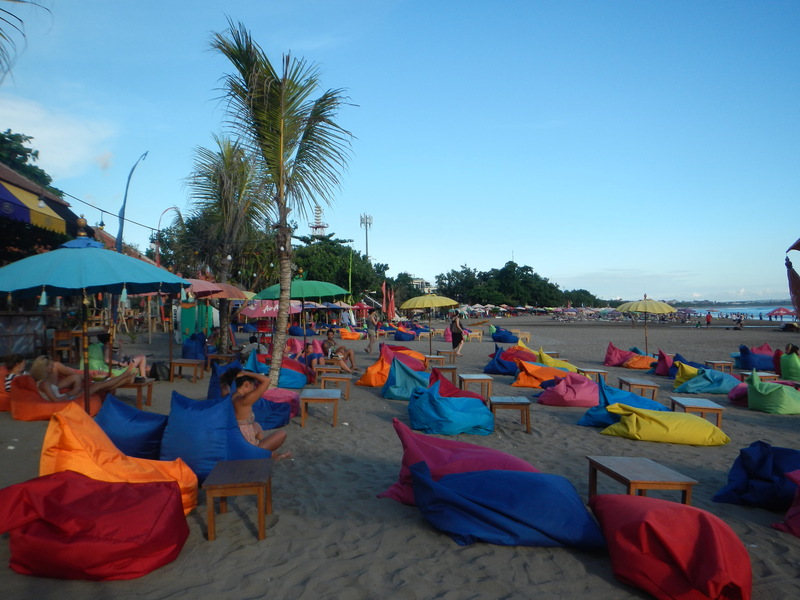 In the distance we could see the beach extending to Legian and Kuta, and every inch was littered with coloured beach umbrellas, each attached to a bar. For what it was, Seminyak wasn’t that bad in the end. Of the three towns on that beach front, it is the most upmarket, with some pretty impressive luxury villas. There are a few budget places too (like where we stayed), but in general, there aren’t many backpackers roaming the streets looking for cheap beer. 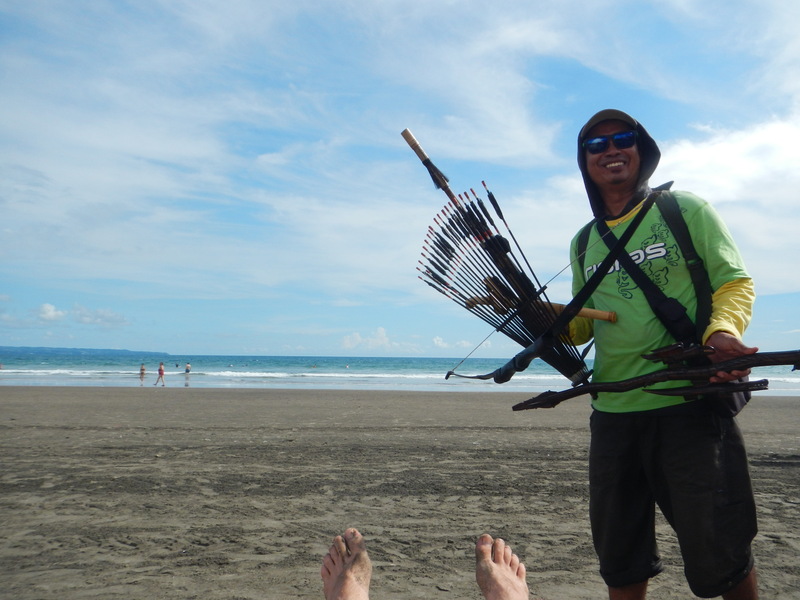 With a whole day to kill until our night flight, we walked to Kuta. 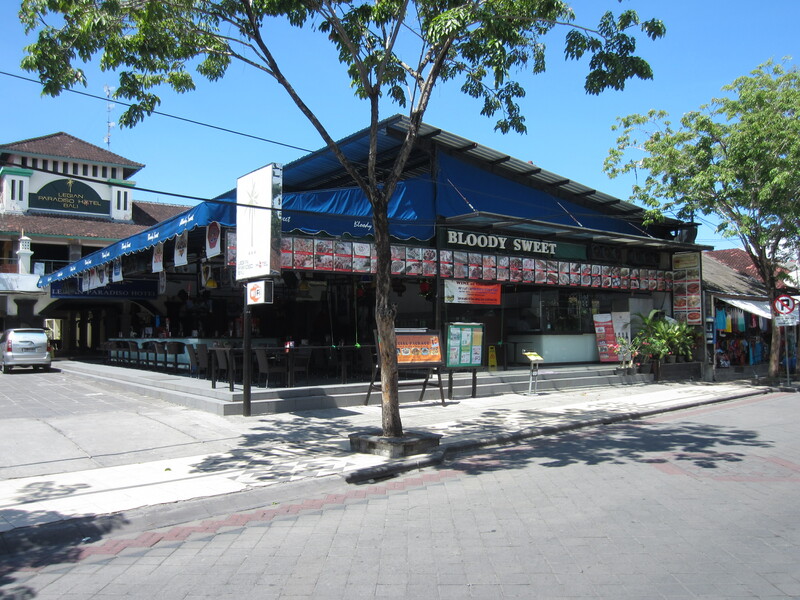 I knew Kuta by reputation before we arrived, and I was curious. Oh, jeez. One of those places where people think they can act like drunken louts, just because they’re on holiday and have money to throw at the locals. Consequently, the entire culture of the place has been modified to mirror the visitors, instead of expressing the land of the locals. At least Khao San Road in Bangkok was definitely Thai, and despite the big backpacker presence, it at least had Thai character. Kuta seemed no longer Indonesian. I didn’t like how shopkeepers bluntly called me ‘Hey you!’, and tried to follow me. I didn’t like the Australian themed bars with terrible Australian names. I didn’t like seeing KFC and McDonalds and Subway. I hated all the sexist, homophobic and xenophobic bumper stickers for sale. Do the locals even realise what they say? What kind of bogans take them home for their car? (Seriously, do a Google search for Kuta bumper stickers to see some mysogyny). I especially didn’t like the feeling that here, locals probably saw me as just another tourist sucker to sell stuff to. And we didn’t even see Kuta at night! The solution? We sequestered ourselves in the Hard Rock Café, ate ice cream, and ignored Kuta until our flight. I agree…but sandly I don’t think Bali is the place to find it. That volcano on Java, for example, looks stunning! And I’m sure it’s not filled with drunk idiots either! That does sound disappointing. Shame when a beautiful beach spot transforms itself to something that can be found in soo many other places instead of capitalizing on its own features. Happens all the time doesn’t it. Yeah, but in the end, what can you do. It’s obviously super popular with certain types of people (those that just want to have a destructive, sleazy party binge in a place that isn’t their home town), so I suppose just leave them be. I won’t be going anywhere near Kuta from now on, because I know there’s many more beautiful places I can enjoy around the world. It’s just a prime example of mass tourism completely re-shaping a place to accommodate the visitors. In the end it felt like some beach town in Australia. Seminyak, though similar, still felt like we were in Bali. True, I actually felt it all over bali but it was the most obvious in kuta..BUT I do believe there are still places in bali that remains untouched and yet to be explored in full…although I suppose it’s just a matter of time before tourism gets a foot into such places too…. Kuta has nothing authentique! It’s like Australians imported Kings Cross there! Exactly! I’m happy we didn’t see it at night. It would be full of douchebags like that guy from ‘What Really Happens in Bali’ walking up and down all the bar streets, haha! And at least King’s Cross is full of police! I enjoy your writing and your perspective. I, too, want to see the ‘real thing’ when I visit new places; I appreciate your candid comments positive and negative. And, thanks for checking out my blog. Check out the posts on Australia. My last post was very simple, I’ll be doing more on Hong Kong & Canada soon.